Pope Francis meets a group of migrants, during his weekly general audience, at the Vatican, Wednesday, Sept. 27, 2017. To his left is Sister Norma Pimentel orf McAllen. 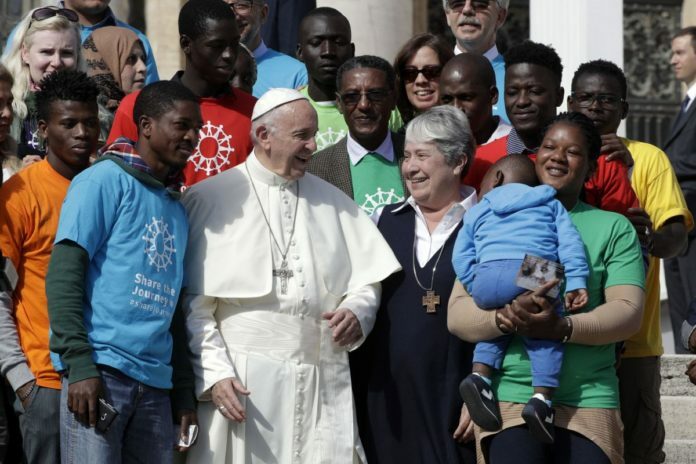 Pope Francis on Wednesday launched a two-year activism and awareness-raising campaign about the plight of migrants to counteract mounting anti-immigrant sentiment in the U.S., Europe and beyond. McALLEN — Sister Norma Pimentel, who spearheaded local immigrant relief efforts, represented the United States during a ceremony at the Vatican on Wednesday, where Pope Francis encouraged followers to listen to the stories of migrants and refugees from across the globe in order to break down barriers of fear and suspicion. Pimentel, director of Catholic Charities of the Rio Grande Valley, has garnered international recognition for her work with Central American immigrants who flooded South Texas beginning in 2014. Her relief efforts at the Humanitarian Respite Center at Sacred Heart — where tens of thousands of immigrants sought refuge after federal authorities released them into the community — previously caught the attention of the Pope. He addressed her personally during a virtual papal audience hosted by ABC News in 2015. Most recently, however, the Vatican reached out and invited her and Brenda Nettles Riojas, communications director for the Roman Catholic Diocese of Brownsville, to attend the launch of a two-year campaign called “Share the Journey.” The initiative, spearheaded by the Vatican’s Caritas charity, aims to build bridges of understanding and hospitality toward the displaced. “It’s definitely an amazing honor to be recognized and be picked among many people doing such wonderful work,” Pimentel said about the invitation Wednesday. She spoke to The Monitor from Rome via phone just hours after she participated in the ceremony, which drew a crowd of about 60,000 people. The local nun was the only woman invited to participate in a four-person panel and a news conference held after the launch, Nettles Riojas said. Nettles Riojas said some of the attendees could not believe how welcoming the region had been when faced with a humanitarian crisis a couple of years ago. “I think it speaks to the work that Sister Norma oversees and the work of all the people of the Rio Grande Valley,” the communications director said. Pimentel was joined Wednesday by a group of about 20 refugees from Syria, Africa, Cuba and Ethiopia. “They’re asking for protection and they’re asking to be safe,” Pimentel said. The pope’s announcement comes at a time in which fear of immigrants has become a much-discussed and heated topic. In the United States, President Donald Trump is pressing for sweeping limits on immigration, including restricting travel from Muslim and other countries and slashing refugee admissions, the Associated Press reported. In Germany’s election on Sunday, the nationalist, anti-migrant party secured seats in that country’s parliament for the first time.